But I know Jamil Naqsh paints. And paints constantly, consistently and continuously. If our art critics want to judge a painter by the number of exhibitions he has held, then Jamil Naqsh most certainly cuts a rather disappointing figure. But if creative and active painter is one who paints then Jamil Naqsh is very much there. “Must you exhibit if your paint?” he asks and then adds hurriedly, “I have no particular aversion against exhibiting my works, and no complaints against others exhibiting theirs”. “But”, he says, “I am definitely against meeting a deadline — a deadline of the date announced — and producing a sufficient number of canvases in a variety of shapes and sizes. I am against exhibition-inspired paintings”. “If you can drawn a line between journalism and literature than you should not find it difficult to appreciate, my difficulty and inability to paint for the sake of exhibiting them”. carefully with paint still wet on them. This was a sort of journalism in paint. But those were early days of his career as a painter. He was perhaps then keen and in a hurry for recognition. And recognition he got in plenty. In the wav of a gold medal: favourable generous coverage by the Press; plenty of buyers; and the rest of it. But now he doesn’t seem to be in a hurry at all. What does Jamil Naqsh paint? For the last eight years or so he is painting pigeons and women. “If you’ve seen one of Jamil Naqsh’s paintings, you have seen them all”, some people say with their usual air of all-knowing authority. Reason: “Pigeons and women is about all that he can paint”, they say. But Ali Imam, a fellow artist, has different views: “Jamil Naqsh is one of our most talented painters. His job is very difficult, very delicate. He has disciplined himself to women and pigeons as his motifs and consequently given himself very little room to move about. Yet the ease with which he moves about is tremendous”. There are others among the critics who say: “Jamil Naqsh has no imagination”. Reason: “Women and pigeons is about all that he can think of”. But Shakir Ali has a different opinioif: “Jamil Naqsh is an important and very significant painter of our country. He has a good command over craftsmanship and lots of imagination”. “Selection and choice of motifs”, says Shakir Ali, “is arbitrary — the artist’s own prerogative”. Jamil Naqsh says: “I have no story to tell, no symphony to play, no poem to recite, no plot to carry through, no climax, no anti-climax. All these things are expected of a painter by the uninitiated audience. And if any painter is supplying all these elements through his paintings then he is not only fooling the people but fooling himself”. “My medium is painting which obviously is different from other media of fine arts. If you must find a plot or a story, music or metre, then you should find them in my treatment of my colours on the motifs that I paint: in texture, form and composition. Most certainly not in my motifs”. As flitting from one subject to another is typically amateurish, faithfulness to one motif should be considered a sign of maturity. There are so many precedents and examples of very eminent and successful artists who stuck steadfastly to just one single subject and spent their lives probing it — finding newer ad newer dimensions, depths, angles without in any way feeling handicapped. Jamil Naqsh is doing the same. He betrays no dissatisfaction with the motifs he has chosen to express himself — woman and pigeon. 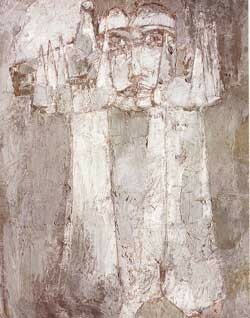 Jamil Naqsh. Shaherzad. Zahoor ul Iqhlaq. Baseer Ashraf. Bashir Mirza. Standing. Shahid Sajad. Ershad Ali Bukhari. Maqsood Ali. Naheed Raza. Mansur Aye. Sahiba Ashraf. Samina. Lubna Agha. Karachi 1970. Sometimes I get a horrible feeling that Jamil Naqsh somehow has found this short-cut to maturity and decided to make it his. To be fair to Jamil Naqsh. I would like to point out one thing that he didn’t quite jump to his “mature” selection of motifs. He started in the classical way: As Sultan Ahmed once wrote: “Jamil Naqsh began with everything. He did landscapes, still- life, human figures, street scenes, nudes etc. And he proved remarkably good in drawing, composition and colours”. Whether Jamil Naqsh is a precocious child in the world of painting, or is a prematurely mature artist, only time will tell. I asked Shakir Ali whether he could short-list good painters of our country. He lost no time in saying: “You can count them on your finger-tips”. Will you include Jamil Naqsh among them?